Posted on August 25, 2012 by Ching under Food and Drink, Reviews. Paisano’s is another Topeka favorite. I’ve been here a couple of times, but someone has always taken me so I really don’t know where it is. I suppose I could enter the address in my GPS. The restaurant has been around a long time so it shouldn’t be a problem. Although, I didn’t have to worry about finding the place because Rachel drove and she is very familiar with the area. I was so happy to find her in the same training class. We used to work together in the same department about ten years ago. She started a month before I did. It was nice to be able to catch up. And, it was also nice not having to eat dinner alone for a change. I accidentally ordered the Chicken Spidini Diavolo instead of the Carcciofi Spidini, which I probably would have liked better since I don’t really like spicy foods. That spicy diavolo sauce is no joke. It was so spicy, I couldn’t even taste the marinara sauce of the spaghetti. Unless, they put spicy diavolo sauce over it too. It was dark in the restaurant so I couldn’t tell. LOL. I wasn’t a huge fan of this dish, but that isn’t the restaurant’s fault. I just don’t like spicy foods and I made the mistake of ordering the spiciest dish on the menu. It’s ID10T error, as Mel at work always puts it. LOL. I don’t ever remember having a bad meal at Paisano’s and this was actually pretty good. Seriously. I ate most of it. Then again, that doesn’t say much, as Brian thinks I am a human garbage disposal and will eat just about anything. 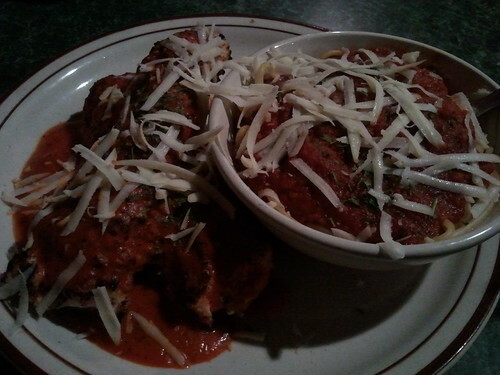 I’m actually looking forward to going back to Paisano’s again and ordering the dish that I intended to order. I’m curious what it tastes like. I’ll have to make a mental note of this for the next time I have an overnight stay in Topeka.